1 LED Lighting Units are here now and are much of the future. LED Lighting Units are here now and are much of the future. When I worked on the first edition of this book I did not recommend LED units for anything other then coloring silver truss with primary colors. Times have changed and technology has really improved. Don’t be mistaken, there are cheap units out there that are still only good for primary colors on something reflective. There are also professional quality units out there that can give you almost any color you want including light tints. This is a section not to skimp in budget. Quality in LED lighting comes with a cost but have incredible saving opportunities. LED units do not use a dimmer. Their intensity control is purely with internal computer chips and receive their information from your DMX controller. They last an incredible amount of lamp life hours. You do not have to pay to replace the lamp. By the time a LED burns out you will be either retired or looking for the newest technology again. When you do not have to change a lamp you have a huge labor savings. Then think about the reduced power draw on your electrical bill. Not only is the unit going to take less power, so will your air conditioning system. You will have happier audience members when they are comfortable and not sweltering hot. You will spend less money on perishable gel as you will adjust your color from the lighting controller. With that being said there is also some benefit to using white LED units and matching it up with particular gels that you love. When using DJ LED lights you no longer have a duty cycle. RGB – Red, Green and Blue LED’s. The concept is that with the three primaries you can get any color you want. It’s simply not true. These are good for solid primary sort of colors. RGBA – Red, Green, Blue and Amber LED’s – Getting much better at being able to color mix. 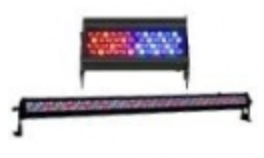 RGBW – Red, Green, Blue and White LED’s – Also much better at color mixing then just the RGB. RGBWA – Red, Green, Blue, White and Amber LED’s – Go to town and color mix to abandon! Here is a frustrating truth. When LED units first came out there was no universal way of categorizing them. Some equated them to conventional Par 64’s or Par 56’s. Some of them listed them as the amount of LED’s the unit possessed. Neither was very helpful or accurate as to the actual output of the light. Because of this I have made my own system. I judge them by how far I think they are going to give you an effective throw of light. That is how I have listed them below. The 5 to 12 foot throw grouping is fun for small rooms and parties. This is not a professional category. This is simply to throw some color, dance to it and just have some fun. Browse our selection of LED single can wash lights with 5′ – 12′ throw distance. The 10 to 20 foot category is a mixture of good DJ quality and short throw professional. You will be able to see the difference purely by price. Quite honestly, the more expensive these units are the brighter and smoother the dimming curve is. Browse our selection of LED single can wash lights with 10′ – 20′ throw distance. The 18 to 40 foot category is where you start getting some units to really be proud of. The output is strong and it’s color mixes quite well. Browse our selection of LED single can wash lights with 18′ – 40′ throw distance. The 30 to 50 foot category – The only thing I am going to say about this is that Radio City would be proud to use these! Browse our selection of LED single can wash lights with 30′ – 50′ throw distance. When you are looking to color the outside of a building or doing outdoor theater, these are the safest way of doing it. 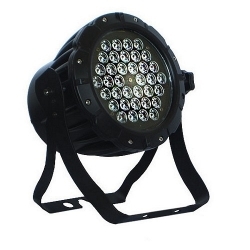 Browse our selection of outdoor rated LED single can wash lights. If you want to decorate for Halloween and not charge anyone – go for it. Browse our selection of small, decorative, LED single can wash lights. Lighting a cyc is always one of the biggest and most important challenges for a lighting designer. The advantages of being able to do it with LED fixtures can be many. One of which is that with the more professional units you can control each and every cell one by one. You can do a moving rainbow on your cyc. Not to harp on this, but if you choose cheap LED fixtures for a cyc you will be displeased with the dimming curve and the throw distance. This is an investment for the life of your theatre. Browse all our LED wash lights. This category gives you examples of individual units that you would use to either uplight a column or wash a cyc. Instead of having multiple cells next to each other, these units will give you a certain width of light on their own. 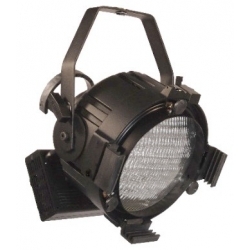 Browse our selection of LED cyc & uplight wash lights. This section shows you units that have multiple cells that will give you a more linear format. The more professional models allow you to group the cells to as many or as few as you like. This can make coloring drops much more adventureful and being able to do different color moving effects. 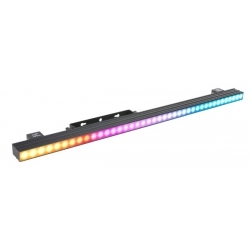 Browse all our LED strip & border lights. Browse our selection of LED strip wash lights. 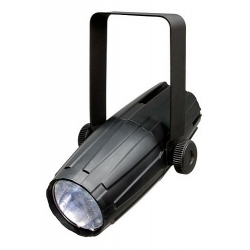 A spot light is a unit that throws a defined beam of light. Some people classify followspots as just the one and only spot light. Obviously I disagree. They are a type of spot light, one that can follow something or someone. So in this section you will find ellipsoidal spot lights, followspots, pin spots and a new section of gobo spots. 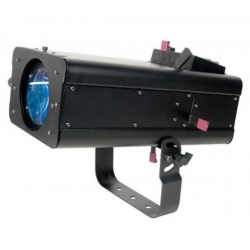 While an ellipsoidal can project gobos it can also do a lot more. There are now units that just project gobos. The benefit to that is that they are cheaper and if that is the only functionality you need then you can save your budget with them. 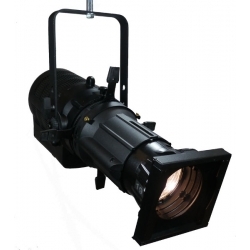 An Ellipsoidal is classically one of the most used lighting units in the industry. It is popular because of the control you can have of the light. While it begins with a circle of light you can adjust the size, hardness, shape and color at the time of focus. This is a LED option to this unit. Some produce white light that you color with gel and others have internal mechanisms to change the color. The price point is higher then conventional ellipsoidals, but with all LED units the savings is in lamp life and power reduction. 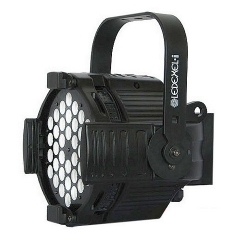 LED Followspots give you all of the flexibility as regular followspots while running incredibly cool and at an incredibly low power draw. If you are in a small classroom setting with a small amount of power this is an incredibly helpful style of unit. Browse our selection of LED followspots. LED Pin Spots throw a tight even field circle of light. They are great for things like highlighting a small object or creating that sparkly effect with a mirror ball. Browse our selection of LED pin spots. 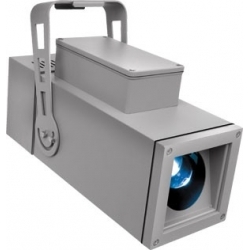 LED Gobo/Slide projectors are simple LED units that really are only meant to project a gobo or slide. The gobo can be metal or plastic because of the low heat. Some of these units allow you to print out your own slide on transparent plastic from your own printer. Many retail establishments are using these units to project their store logos for advertisement. 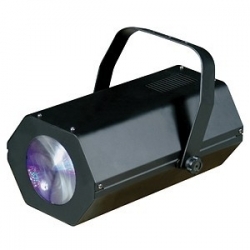 Browse our selection of LED gobo/slide projectors. 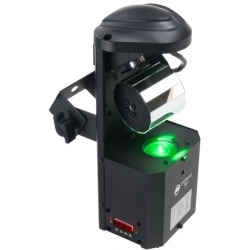 LED Moving Head Spots are a wonderful bridging of conventional moving head spots with the low power draw of the LED world. Imagine being able to do everything a moving head does with hardly any power draw or heat! 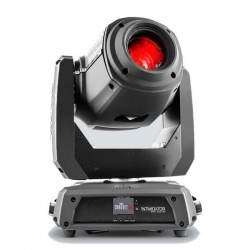 While there are some conventional moving heads that are still brighter then the LED units, the LED’s are catching up quickly and are bright enough now for most uses. 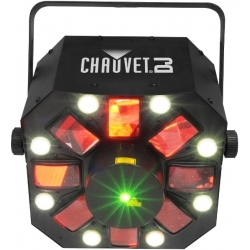 Browse our selection of LED moving spot lights. 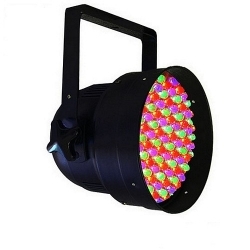 LED Moving Wash Lights not only let you place the light any where you want but let you do all of the color mixing from your lighting console. Low Power – Low Heat! Be able to pack your pack with these with one electrical circuit. Browse our selection of LED moving wash lights. LED Effect Lights do all of the fun things that conventional effect lights do but without duty cycles and at an incredibly low power consumption. The Derby is generally a side to side with some up and down dancing of light creating many single beams of light. Click into the category and go to each unit to watch the videos they are very helpful. Browse our selection of LED derby effect lights. Browse our selection of LED moonflower effect lights. The scanner effect category gives you units with a lot of variation coming out of them. Their variation is very helpful in filling out your dance floor. Click into the category and go to each unit to watch the videos – they are very helpful! 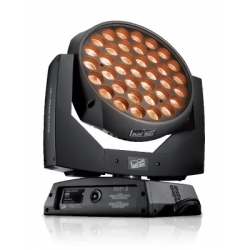 Browse our selection of LED scanner effect lights. 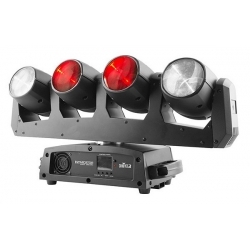 Browse our selection of LED multi-beam effect lights. Instead of reflecting dots off of a mirror ball, these units produce the dots from inside. These make for great center pieces to your club area. 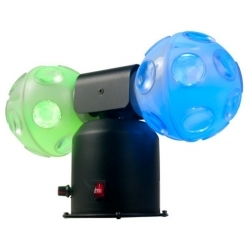 Browse our selection of LED spinning dots effect lights. 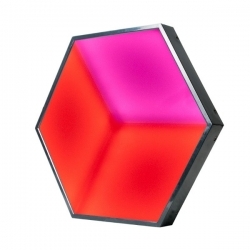 These units can either be used in projecting fun colorful effects or being used as actual pieces of scenery. 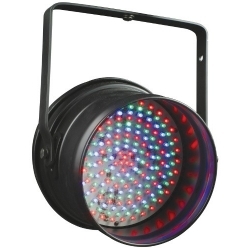 Browse our selection of LED pixel-mapping effect lights. LED Video Screen panels can make small to huge video panel walls. If you are looking for the ability to continually change the scenery behind you, then this is something to look into – not for the faint budget minded. Browse our selection of LED video screens.